How often do you leverage your LinkedIn network? Do you want to strategically improve and grow your connections? In building your LinkedIn network, the more selective you are, the more valuable your network is. In this article I’ll explain how to build a smart LinkedIn network. Why Build a Smart LinkedIn Network? LinkedIn can give you exposure and access to important people, help you attract new prospects, keep you in front of existing clients and vendors, spark marketing or business partnership possibilities, generate more introductions and referrals, provide invitations to speak at events or conferences, uncover media or press inquiries and much more. 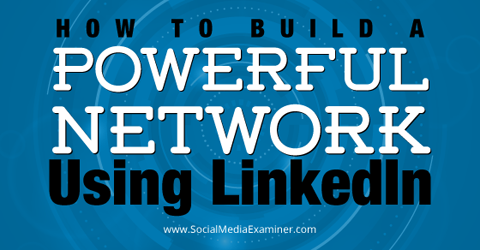 Find out how to build a powerful network using LinkedIn. A smart LinkedIn network doesn’t just occur naturally. Although LinkedIn attempts to help you build a smart network, you still must do your part to cultivate relevant and valuable connections. Upload your email contacts into LinkedIn to seed your “smart” network. This is low-hanging fruit for expanding your network with highly relevant connections. LinkedIn allows you to import your existing email contacts from Gmail, Yahoo, Outlook and others into the platform, so start by connecting with people you already trust. Although people have expressed concerns about allowing LinkedIn to access their contacts, it’s really no different than sharing your personal information with any other social network or through your smartphone. Keep in mind that LinkedIn also gives you the ability to export your contacts at any time. To expand your network through email, go to Connections on the top navigation and then click Add Connections. Select the email provider. LinkedIn will walk you through the rest. Import your contacts from a variety of email providers to LinkedIn through the Add Connections screen. When you import your contacts to LinkedIn, make sure that you don’t select the option to send all of them a generic invitation to connect. You’ll want to work through your contacts one by one. 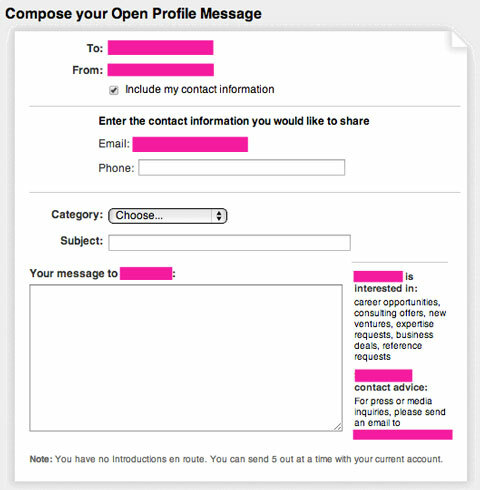 That way, you can easily decipher who you are not already connected with, filter out older contacts (Note: you may want to clean up your email contacts before you import them into LinkedIn) and write personalized invitations to the rest. LinkedIn will let you know which of your contacts you are not yet connected with. Once you’re connected, review your contacts’ profiles to gather more intelligence about them. Then determine how you can add value to their professional lives and review their connections for future relationship-building. You’ll gain significant benefits from allowing LinkedIn to “borrow” your contacts via the import process. After you’ve expanded your network to include connections you already trust, LinkedIn will better understand the types of people you have as official contacts. In turn, LinkedIn will find more relevant people to suggest to you for building your network through its People You May Know feature. Ultimately the intelligence you gather from importing your contacts into LinkedIn can be extremely valuable in building your network. As your LinkedIn network expands, you’ll likely receive new invitations to connect on a daily basis. Use discretion with these invites, so you’ll be able to better control the quality of your network. Note: If you’re new to LinkedIn, you may be tempted to accept every invitation that comes in, but down the road it can dilute the value of your network. It’s important to balance the costs and benefits of connecting with people you may not know well or at all on LinkedIn. Not all invitations to connect should be accepted. It is quite possible for people to know who you are and want to connect with you without you knowing them; especially if you’re an author, speaker or influential person. Ask your audiences to please provide where they saw or heard you speak, along with their reason for wanting to connect with you, if they reach out to you to connect on LinkedIn. Note: This is also why you should provide a reason when you connect with a stranger or acquaintance. Set up your own discretionary rules for who you’re going to accept invitations from on LinkedIn. It’ll save you time down the road and make for a much smarter LinkedIn network. Weigh any invitation to connect carefully. Image: Shutterstock. Whether you’re new to LinkedIn or have been developing your network for a while, you’ve likely noticed a variety of “clusters,” or groups of connections. Your network clusters represent your unique market opportunity on LinkedIn, and are a great place to look for new connections. Identify your network clusters and then dig deeper within each one. View the networks of your connections to find more relevant people to invite to connect. Also, look for opportunities to introduce people you know within a network cluster or between your network clusters! LinkedIn provides a few options for sorting your connections into logical network clusters. You can sort by company, location, title or source. View your connections based on location, company, title and source. Then see the other people they know within your clusters to find potential connections to target. 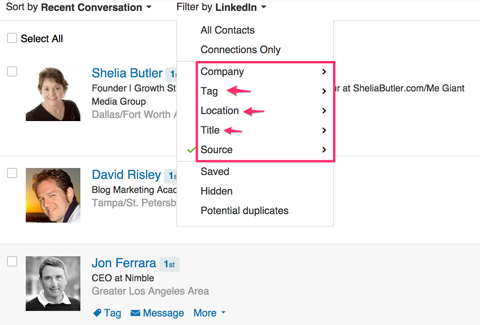 To manually segment your network beyond what LinkedIn already provides, use the LinkedIn Tags feature. Set up tags and spend a little time each week organizing your connections. Tag the new people you connect with on LinkedIn as you go. Note: You can also tag or segment your LinkedIn network members using an outside CRM program if you prefer. Use clusters to find new connections to grow your LinkedIn network. LinkedIn groups are a great source for finding new connections. LinkedIn groups have become tougher to wade through, since many are not managed well and are overrun by spam. However, there are still plenty of high-quality groups. You just have to do your research. Don’t use LinkedIn groups for marketing yourself. Use them for discovering and connecting with the people who fit into your smart LinkedIn network. If you share a group membership with someone, send an invitation to connect based on this association. First go to the desired LinkedIn group and click on Members to pull up the list of members in the group. Before you send a group member a connection request, send a personalized message. Scroll through the members until you see those who are not first-degree connections, and send a personal message saying that you would like to connect with them on LinkedIn and let them know that you’re in the group together. Mine your LinkedIn group memberships for the gems. Utilize groups as a gateway for discovering and connecting with relevant people who fit into your network-building strategy. 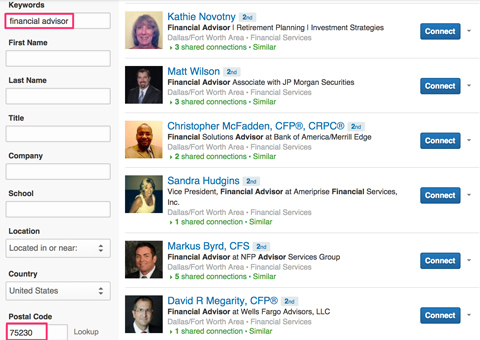 The Advanced Search tool on LinkedIn is another great way to strategically expand your network. Use LinkedIn filters to search by keyword (for example, job titles), location, company, school and more. Be aware that premium LinkedIn accounts allow more searches, search parameters and saved searches; however, you still can get some of these benefits with a free LinkedIn account. To make the results more targeted, when conducting advanced searches on LinkedIn, zero in on more than one search parameter. Identify highly relevant connections using LinkedIn’s Advanced Search tool. For example, the image above shows where I conducted a search for the keyword “financial advisor” within 10 miles of my zip code. I specified that I wanted second-degree connections only. LinkedIn showed me over 900 potential connections in this search. Within your search results, you’ll see how many connections you have in common with each person listed, as well as the identities of those common connections. If you wish, also click through to review their profiles. LinkedIn makes it easy to send a quick invitation to the people listed in your search results using a simple Connect button. Keep in mind that you will NOT be able to customize this invite. Use this Connect button sparingly. Some LinkedIn users allow you to message them without being connected. If the option exists, send a personalized message initially that lets the person know why you would like to connect. Then send the official invitation. LinkedIn Advanced Search is an underutilized tool for discovering great people who logically fit into your LinkedIn network. The stronger your LinkedIn network, the more you’ll benefit from it. Building a smart LinkedIn network isn’t just about growing it. Occasionally you’ll want to prune your LinkedIn network to get rid of dated connections. Review, clean up and improve your LinkedIn network over time. Chances are you’ve made some connections on LinkedIn who don’t fit into your targeted network clusters. It’s okay to remove them. The value of a “smart” LinkedIn network is truly priceless. When you connect and engage with the right people on LinkedIn, professional opportunities will emerge. Plus, you’ll naturally be in a better position to add value to your network members. A smarter LinkedIn network will open doors for you and your business, so work on it a little each day. The results will definitely outweigh the time you spend cultivating it. What do you think? Have you tried to build a smarter LinkedIn network? Do you see the value in doing so? Are you in favor of limiting your connections or connecting with as many people as possible on LinkedIn? I’d love to hear your opinions on this. Please share your thoughts in the comments. Scale icon photo from Shutterstock.